Educational instruments – For the fainthearted . . . There was an odd feeling of disorientation, standing and surveying the abundant array of pens and pencils, the assorted accessories, the sophisticated calculators, the highlighter pens and the erasers. When did buying things for school course become a matter of deciding between so many and varied options? One could have spent the best part of a good deal and still gone away feeling there was more that could have been bought. A ruler brought an involuntary giggle – a Helix Oxford Folding Ruler. 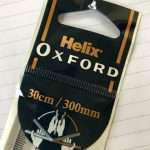 There was a plentiful supply of folding rulers in schooldays, their chief drawback was that they did not fold back. Plastic rulers were appearing, but the standard classroom ruler was wooden. On one side, there were twelve inches marked in whole and quarter-inches, on the reverse, thirty centimetres marked in centimetres and millimetres. Rulers were not much used for mathematical purposes: they were for drawing lines, if such were necessary; flicking screwed- up balls of paper across the classroom; or enacting battle scenes from Alexandre Dumas’ The Three Musketeers. The soft wood from which they were manufactured allowed one to easily engrave them with the point of a pair of compasses, or to write the names of miscellaneous football clubs, pop groups, or girlfriends, in different coloured ink. It was a rare ruler that resembled the condition in which it was purchased. The folding of one’s own ruler could be a mark of frustration; the folding of someone else’s ruler was generally a mark of annoyance. Having a ruler reduced to half of its former size was rarely a problem; lines in exercise books could still be drawn with what remained. The shop shelf space required to supply an average schoolboy with the necessary equipment for his education would have been fairly limited. 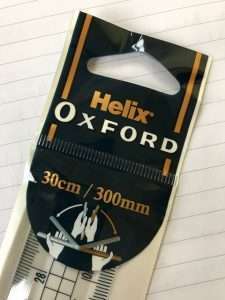 Along with the ruler there would have been a Platignum cartridge pen, the nib of which would have been bent and much of the contents of the cartridges would have appeared as blots on the page. Pencils would have been chewed and sharpened to stubs. A tin of mathematical instruments would have included a pair of compasses, a set square and a protractor. If the ruler was in too bad a state for drawing lines, the set square would suffice, and, in its absence, the straight edge of the protractor might have been used. Erasers were invariably in short supply, probably because they had been employed as missiles in classroom battles while the teacher was writing on the board. Of course, there were the options of having felt tip pens and coloured pencils, but colour and beauty were considered too “feminine” to be the product of a boy’s pencil case. Arranging the purchases in a neat row on the desk, preparing to learn be the teacher, there was a realisation that it would be very different this time around. And even if it is a folding ruler, woe betide anyone who folds it.